. :: The Perils Of Show Jumping Sport - 11 ::. 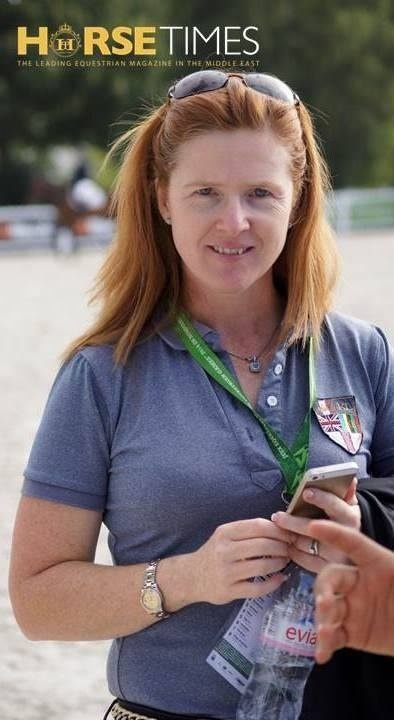 So it's been a day since the end of the Alltech FEI World Equestrian Games 2014 in Normandy (WEG) - and, the first chance I've had to catch up on my blog! As I write I'm on a coach to Dublin where I will fly to London and then on to Calgary, Canada, where it is snowing, for the Spruce Meadows Masters International show jumping event. But more about that later. It seems light years ago since the Egyptian team was in Normandy - although, in reality only a few days have passed! But what an experience the WEG was. The last day for our team was on Wednesday September 3rd. An incredible day; Sam El Dahan and Summa's Zorro were third from the start list to go into the arena and into what turned out to be a very difficult course indeed. To be honest, first and second in, were McLain Ward for USA and, Jan Candle for Canada who, had made it look straight forward - both returning clear. So Sam wasn't so daunted entering the arena - and what a round he and Zorro jumped! The 2nd fence was a full up 160 m vertical before a huge oxer with a water ditch underneath which was to cause many horses to land short on the back rail as the class progressed - but Zorro truly soared over it! It wasn't until the last line that she got too deep off the corner - and although she tried to clear the last fence, she just touched the front rail - it wavered in the cup for a second. We all held our collective breaths.....And then thud down it landed. It was only then, I looked at the scoreboard and saw eight faults instead of four. She'd touched the tape on landing over the huge water ditch; a very costly mistake in what otherwise looked like a beautiful four-fault round. It was the team qualifier and with Egypt lying in 13th out of 30 places. The second day (Thursday) was all to play for with the top ten teams going through to the next day's final. Sam's result wasn't ideal but still not a disaster - all we needed was a clear round. The next member of the Egyptian team to go in, was Nayal Nassar who, unfortunately, knocked two poles down, although he soared over the water. The third member of the team, Abdel Said, riding the stunning looking stallion Vingino, unusually took a dislike to the combination. 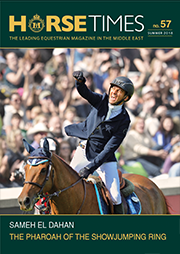 The last of the four Egyptian riders, Karim El Zoghby, riding the beautiful bay mare Amelia was going to require nothing short of a miracle round to enable the team to compete in the next level of the competition. I would love to describe the experience like a sweet Disney movie, how they managed to pull it out of the bag and every other team later faulted, but unfortunately this is real life, and these are real breathing animals who like you and I, get tired. Amelia is only nine and she will have many other show jumping days to come and, do better. In all, the first Egyptian team for decades had an amazing time together at the WEG. This is not to say that they swept all before them, but is a great indication of their potential for the future. They all rocked up in Normandy, determined to try and win. They might not have the budget or unlimited horsepower in the way that some of their Arab neighbours regularly provide but, what these guys lacked in material, they made up for in terms of sheer grit and determination. Like the Moroccan team with the amazing combination of Abdelkebir and the fabulous stallion Quickly, the Egyptians showed the world stage how far they have come. With Qatar's Sheikh Ali Al Thani in the top 30 final and then into the top 15. There is a lot for the Arab world to celebrate from these Games.... It was truly fascinating to watch how these individual nation's riders have grown from the last Kentucky WEG four years ago. At this rate the next 2018 WEG in Bromont, Canada, will be very interesting indeed - and as for the 2016 Olympics in Rio....watch out Europe there are some new kids on the block and they mean business!!!! So we said goodbye to Caen in France, re-routed Zorro to Calgary (after all, she did have a nice warm-up class at the WEG - nice preparation lol) and headed back to Ireland to unload and repack for our trip to The other side of the world!! The richest class in the world and we are heading there! In one month our team will have done two of the things on most rider's bucket list of a lifetime. Sam is riding at the top of his game and our horses look good - fingers crossed we will do well. But even if we don't, I am so proud of how far our Irish mares have come; they are small in comparison to their warmblood compatriots but when it comes to jumping these huge fences, it's not the size of the horse but the heart in the horse that matters. Our system of praise "to never punish" seems to be working, and with Sam's patient and careful handling of them, they are giving him their all.